"This is the first home that Joe and I have owned together. We wanted a Fifties ranch, and that’s what we got. We bought the house from the original owners, who had it custom built in 1957 -- they really thought out everything and spent their money very wisely. Although the house is a typical ranch, it has some amazing little details: a light recessed in the fireplace mantel, great doors, a walk-in cedar closet, a bar, and tons of storage. Once we signed the papers, all the carpet and wallpaper that was everywhere went out the door, the floors were sanded and stained, and the walls were patched and painted. Our favorite thing about house is, surprisingly, the location. 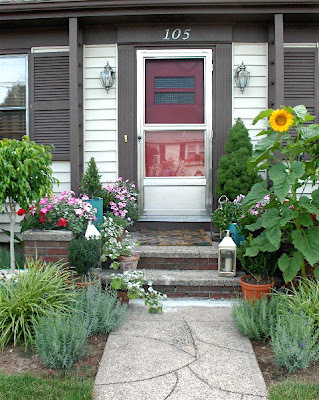 Pawtucket isn’t exactly a hot spot, but we live in a great little neighborhood where we know most of our neighbors. It’s just a great feeling knowing you’re part of a wonderful little community. We’re minutes from both Providence and Boston and we have a huge, beautiful park across the street. Our style is 'traditional with a twist.' I’ve been told that our home is chic and cozy, so I won’t argue with that since it was the look I was going for! I love David Hicks and Billy Baldwin. Joe’s grandmother, from whom we inherited a lot of furniture and accessories, had great taste and completely inspired me. Most of the upholstered pieces in our living room were hers -- I just had them recovered with new fabric. 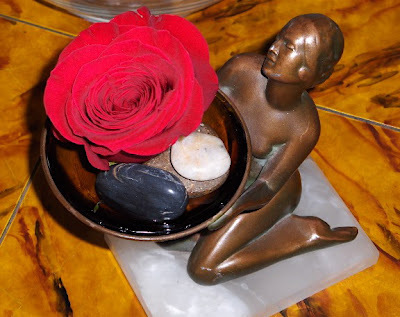 The bronze and marble art nouveau ashtray was hers as well. Here's my advice to others putting together a home: If you're into design, you probably always have been, and that means when you were young you coveted great stuff that your grandmother or mother or favorite aunt owned. NOW IS THE TIME TO GET THAT STUFF! It’s amazing to look around our house and see things that our grandmothers loved or that were on our coffee tables growing up. Fill your home with things you love and that have a history. 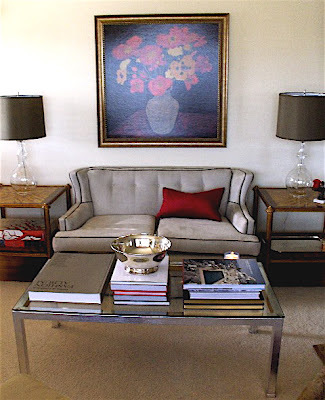 The ultrasuede cubes in the living room are from Crate & Barrel -- as is the coffee table, which I silver leafed. 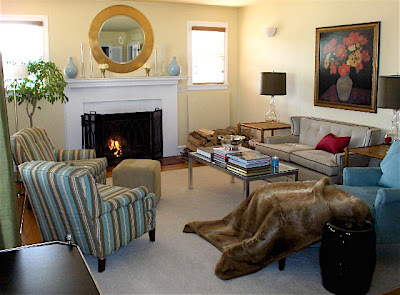 The fur throws are from Pottery Barn -- they save the furniture, because the cat loves them. The rug is the Blanca from Ralph Lauren. The window treatments are from West Elm. I’m fully aware that the art above the sofa is a bit generic, but we love it and that’s all I’m concerned about. I’m a major bargain person am very proud of it. 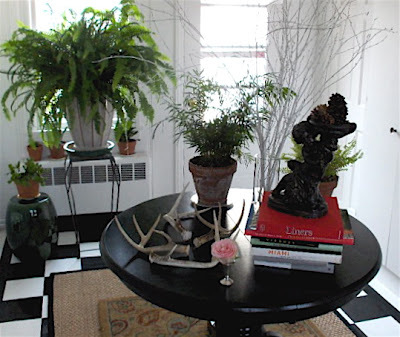 Some of my favorite bargain finds are the two Robert Allen end tables in the living room. They're hand-painted faux tortoise with hand gilding. They retail for $1,200 each, but I got them for $200 because the showroom where I found them was closing. 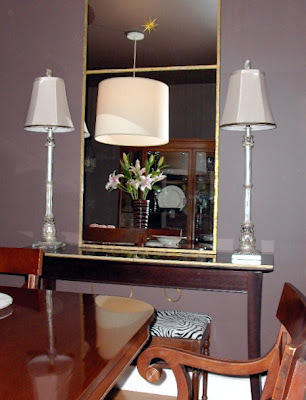 Same with the mirror over the mantel -- it retails for $1,300, but the showroom was having a sale and I got it for $200. I have Jonathan Adler cookie jars in the kitchen that I got for $4 each. I have an amazing Versace bowl that I paid $10 for. I just bought the ceramic garden stool next to the chaise for $40 at HomeGoods. 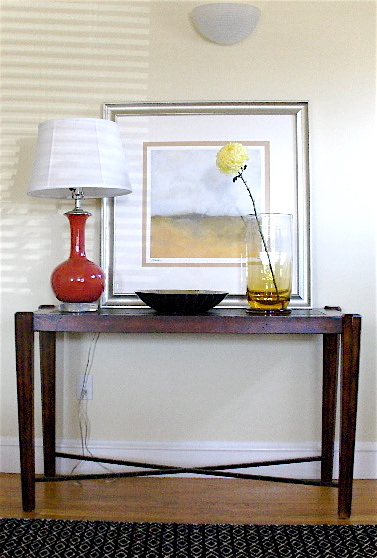 Most of the lamps around the house are HomeGoods finds, too -- although the standing lamp is Thomas O’Brien for Target. 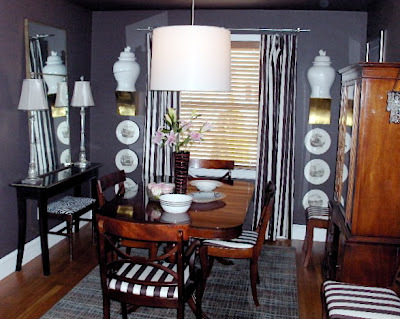 When it comes to bargains, here's the biggie: The mirror in the dining room I paid $24 for a couple of months ago; the same exact one was just in the December issue of Domino and retails for over $1,800 at Mecox Gardens! The ginger jars in the dining room are from Global Bazaar at Target. They were exactly what I was looking for, so why not? The buffet table was also a Target purchase that I topped with granite tiles. I’m not afraid or ashamed to say that I buy cute things from Target when I see them. The plates on the wall are 1950s Wedgwood Piranessi commissioned by the Archdiocese of Boston, which I’ve collected. We live next to a beautiful Catholic church, so it’s only fitting! The pendant light is from Koo de Kir in Boston, and the candle sconces are from Illuminations. The curtains are Waverly's Awning Stripe in Chocolate. The rug is the Sonoma from Karastan. The paint we used in the house is C2 -- love, love, love C2. All of the ceilings are the same color as the walls. I love it -- enough with white ceilings! The dining room color is called Chocolate Therapy. The kitchen is tiny and was full of avocado green when we bought the house. But with paint (C2's Electric), new appliances (from Fridigaire's Gallery Series), and a hardwood floor to match the rest of the house, we made it into something that we love and that’s very efficient. The window coverings are from Pottery Barn. We're not DIY people, and tend to hire everything out (as I believe everyone should). But I did just redo our breezeway, and I’m very happy with it. I painted the floor in a black-and-white checkerboard -- very cost effective! My nephews are hunters, and gave me the antlers after I pleaded for them. I’m not over the antler phenomenon and these actually mean something to me. My nephews find them all the time and sometimes go hunting just for fallen antlers. They have some huge ones that one day I will steal! I'm obviously not a photographer, and the pictures don't do the house justice. I intend to one day have nicer art and furniture -- but cleaning and getting flowers and sort of staging the house made me really appreciate our home and what we've done with it. We're happy and lucky to have what we do!" Thanks so much for the peek into your lovely home, Billy and Joe! I love you and your house and your talent. I am jealous of all that NON-Clutter! Wow, to have a home where you can SEE the floor. Mine's not QUITE that bad, but you've done MARVELOUS things with yours! I'm just amazed at everything. 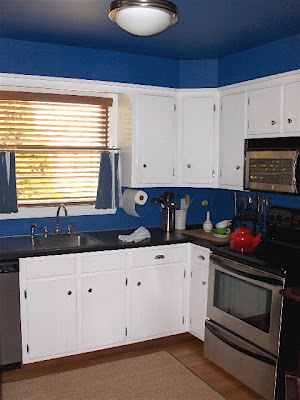 Love the blue kitchen! The buffet in the dining room is one I've been eyeing too. Great minds think alike. What a beautiful, stylish and chic home! I especially love your sofa, coffee table and the two glass lamps. I am having a love affair with gray right now, so I am enamored of your wall colors. I just painted a small powder room dark gray. I am really happy with the way it turned out. Thanks for sharing your gorgeous space. anon: Thank you, I bet yours looks great, post yours! And Good! There is no need to feel bad for buying something you like, I'm tired of being told what I should & should not have in my home! It's my house, I have somewhat good taste, I'm going to fill it with the things I like & can afford. secretleaves: Thank you, what a nice thing to say. Your powder room sounds great! & I checked out your blog, love your work! It's fabulous, as I knew it would be! Love the sofa and the coordinated striped chairs. It's the perfect balance of chic and comfortable. The only thing missing is the champagne! Billy, Darling the house is perfect! Of course I know you and you have a million ideas in that head of yourse so I suspect we will see a new project soon! Your home is so chic but also so clearly lived in. It's so much more interesting that some of the clearly soulless homes in Elle Decor or Architectural Digest. If you make changes (and I know you will), please post them, better yet, show us the whole process! I love it! Thanks so much for the post and the link! My favorites? 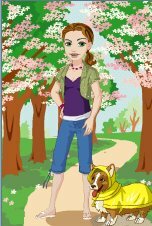 Not, I'm not over the antler thing either. Nor am I over coral, shells, fur, framed exotic beetles (for my sons' rooms)... anything organic. My coral sits proudly on my coffee table and I just bought a vintage fur wrap for the back of a chair in my living room. I think it's those organic things that indicate life in a room. It's the same with flowers. I always keep them around. Sometimes I go to a florist, but usually I just grab some stems from Whole Foods. I love the grand lilies in the center of the dining room table. I did link you... here you go! Your home is exquisite - your flair and panache are evident in your sophisticated but comfortable style. Margaret Russell from Elle Decor should be knocking at your door!